My copy is labelled up Face 1 & 3, 2 & 4? After sitting on the shelf for one or more likely two decades I listened today once again to this untypical Stevie Wonder album. And I have to say: What a shame it sat there for so long unnoticed. 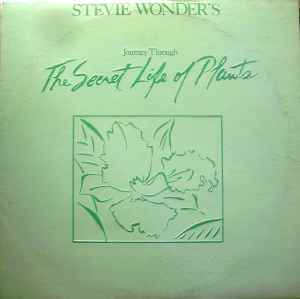 Having heard a lot of Ambient and World music over the years I noticed that Stevie has used many components of these on this album … in 1979 (!) – combined with his very own style and voice. A beautiful piece of music – courageous for the time of creation – which I won't neglect in future as I have done for so long. "No Ike, say it ain't so! You like this one?!?!? It was a waste of plastic (now Cd or Mp3)!" That's all people were telling me about this album, and I wasn't as hardheaded as I am now. I use to listen to everybody (gullible), but years later I did some investagation on this record. Turns out, it's a Sound Track to a very unknown movie called "Journey Through The Secret Life Of Plants." Now it all makes sence! That's why to the average person, this sounds like mess. But since I'm crazy in the head, and I love mess, this sounds perfect to me. I have to give it to Stevie for doing a record like this at the height of his popularity. It yielled one big hit in "Send One Your Love", but I also love "Outside My Window". The melody, mixed with Stevie's take on nature sounds is just grand. I think it's worth it, but I understand if some of you don't think so. Odd release. If you had asked me what year the CD release was, I would say mid-late 80s due to the CD label, but finding out it wasn't released on CD until 2001?